I’ve been reading stories about the Dawes Act on Facebook all week, in part because February 8 marked the anniversary of its passage (some 125 years) and folks have been sharing posts. Indian Country Today Media Network has been running a series about the Act, which, in effect, parceled out Indian territory into individual chunks that could be managed by the Indians or sold or traded to non-Indians. Historians interpret the Act through different lenses. 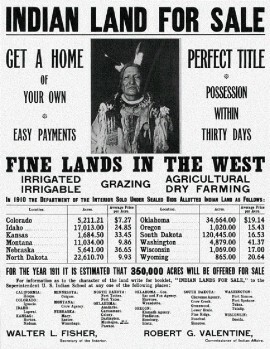 One view is that the selling of lands was out-and-out theft. Another popular view is that legislation would force Indians to adjust to new ways of living and thus become integrated into the settler culture. And some folks defend the Act as the only way legislators knew to “save” the Indian. One author notes that some scientists firmly believed that Indians were a race different from their settler counterparts, and that the “savage” could be tamed and civilized, given the right environment. Robert Bieder writes that the “right environment” included such “civilizing” forces as Christian conversion and individual home ownership. I found a map last summer that shows my grandmother and great-grandmother’s land tracts parceled out at a display at the Osage Museum in Pawhuska. The map illustrates how the Oklahoma landscape was subdivided into little plots, labeled with individual names of the Indian owners. To my untrained eye, the parcels seemed in random order, with my ancestors’ names scattered across the territory. In other words, family members were segmented and segregated. Many Osages sold their parcels, which was the intent of the Dawes Act. In a February 8 story on the Act for Indian Country Today Media Network, writer Gale Courey Toensing notes that the legislation was intended to “civilize” American Indians. This entry was posted in authenticity, ethics, Indian, Osage, Uncategorized, writing and tagged native science, science. Bookmark the permalink. yes even our modern communities today,,neighborhoods,,we are a broken society. I try to get to know my neighbors and only a few are approachable. Don’t missunderstand,I am grateful for and have a very nice neighborhood and is very mixed with many peoples,yet only a few do i really know or can call friends much less a tribe. Even a tribe that was civilized way before any other was still not welcome. I know the Cherokee people lived among the white people very well. They had built homes, farms and traded and sold their goods just like another race would do. They accepted what they got and did their best to obey. They were very much into just wanting to live a peaceful life without complications. But the government still seen them as a threat to the area and the whites. So they pushed them out. So even to the people who tried to live among whites doing as the whites were not welcome either. It’s not all about civilization, it’s about the whites getting what they want, when they wanted and how they wanted. Thank-you for another interesting post.